You are here: Home / Uncategorized / Nothing makes one more giddy then packages! I love it when packages arrive – who doesn’t? Nothing makes me more giddy then seeing a package sitting there waiting for me to open! I knew that my Amazon package was coming today and what do ya know? It was sitting there waiting for me this morning when I opened my door. *grins* Now everything you see above was paid with my Amazon money that I get from the various things I do online. Really what is a better way to buy things? 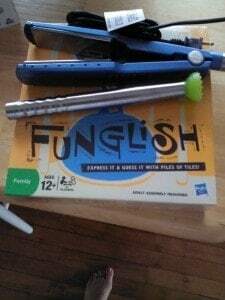 Funglish – which just sounded like so much fun. Something like you try and describe your word with other words? Or something along those lines the box explains it better then I. 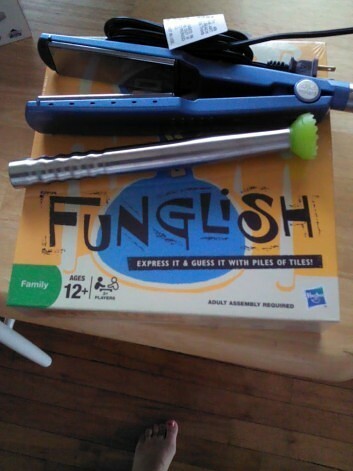 A new game, bring on game night! Plus we have the mojito muddler to make up something yummy drink to go with.